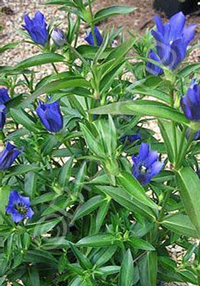 Large 2" tubular blue flowers open at the nodes all up and down the stems, midsummer to early fall. The plant has smooth, green, lance-shaped leaves. Hummingbirds and butterflies love the flowers!